1. 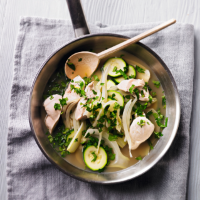 Place the fennel in a wok or deep frying pan and add the chicken, zest and juice and the stock, bring to the boil and simmer, uncovered for 15 minutes. 2. Add the courgette and half the parsley and cook, covered, for a further 5 minutes until the chicken is cooked through with no pink meat. 3. Sprinkle with the remaining parsley and serve.